Much like cauliflower, I wasn’t a brussels sprouts fan until a couple years ago. It totally makes sense. They’re both cruciferous vegetables that I’d only really experienced in their frozen and butter- or cheese-sauced form — a preparation method that does them absolutely no favors (please bear with me as I repeat myself). This recipe is inspired by the fantastic brussels sprouts served at a local San Jose restaurant, Naglee Park Garage. They’ve been featured on Diners, Drive Ins and Dives, where I first learned about this gem of a place located a mere 6 miles from my apartment. Super quaint, it’s a perfect place to eat dinner al fresco on a warm summer evening (heck, I like it so much that I even celebrated my birthday here this past July¹). But back to the sprouts. Roasting ’em takes some of their bitter edge off, and adds a touch of sweetness that is impossible to achieve through steaming or boiling. Plus, they turn a far less sickly green; and we all know how much the visual aspect affects the eating experience. Add to the mix some fried pancetta and garlic, plus, essentially, a bacon vinaigrette (made from the rendered fat, vermouth and lemon juice), and you have a tasty side appropriate for any occasion (Thanksgiving, anyone? Cruciferous Vegetable Night?). If you care to make these for a crowd, the recipe can easily be doubled. Just make sure to use two, large baking sheets and rotate them half way through. When I treated myself to a whole stalk of brussels from Trader Joe’s (it had over two pounds of brussels on it, a wicked value!) and lazily chose to jam them all onto one baking sheet (instead of lining another with parchment), they basically steamed instead of roasting, and weren’t nearly as good. Preheat oven to 450°F, line a large, rimmed baking sheet with parchment paper; set aside. In a medium bowl, toss brussels with olive oil, salt and pepper. Arrange, one of the cut sides down, in a single layer on the prepared baking sheet (space them out so they take up the entire surface of the baking sheet and have plenty of room in between). Roast in preheated oven for about 15 minutes (start checking at 10), or until browned on the side touching the pan and somewhat blistery in spots on top — they should be tender, but not mushy. 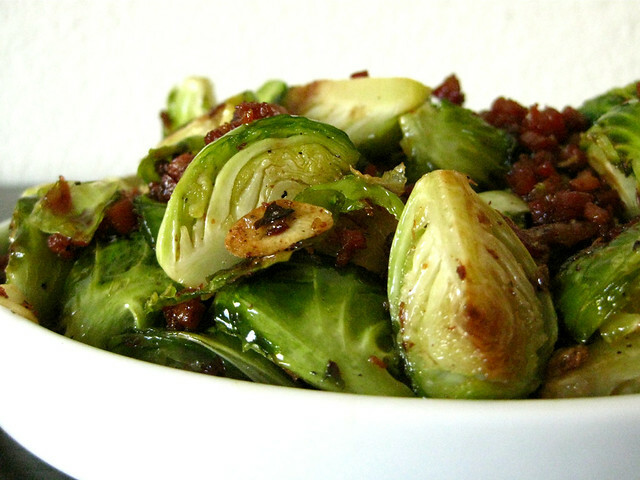 While the brussels are roasting, prepare fried pancetta and garlic sauce. Set a large (4 quart is good; if you’re in the market for a new pan, I REALLY love this one from All-Clad), non-reactive pan over medium heat. Once pan is hot, cook pancetta, stirring occasionally, until crisp. Using a slotted spoon, remove pancetta to a plate when desired crispiness is reached. Reduce heat to medium-low and cook garlic and red pepper flakes (if using) in rendered grease until light golden brown — stir constantly, the garlic can burn and become bitter very easily. Deglaze pan, scraping up any browned bits from the bottom of the pan, with vermouth. Remove pan from heat. Once brussels are roasted, transfer them to the pan with garlic, add pancetta and lemon juice and toss to coat evenly. Season to taste with salt, pepper and additional lemon juice, if desired. Serve immediately. I totally agree – roasting is the best way to cook brussel sprouts! And adding pancetta makes them even better! Aren’t they totally addictive prepared that way? I must admit I ate this entire recipe myself in the span of about 12 hours — combined with a runny yolk egg (fried or poached) they make for a pretty satisfying breakfast — and, let’s just say, I’m very thankful that I work from home. Alone. Sorry for the TMI. I know, I know, not food blog appropriate. But really, I’d do it all over again! I LOVE brussels sprouts, even when I was young which is pretty odd. But they’re amazing and this recipe sounds fantastic! I usually just roast them but this kicks it up a notch. Sounds amazing! I love brussels and the thought of pancetta with them sounds heavenly!! oh yum! like you, i’m a newer brussels sprouts convert, (always had the gross steamed ones before) and i am SO loving them. and thankfully, so is my husband. i think we have to try this. Lacy: My dad is the same way as you, he’s loved ’em since childhood — certainly was not a trait I inherited AT ALL. Most of the time I “merely” roast them, too, this is certainly a treat (mostly due to the 1: 4 ratio of pancetta to brussels) ’round here. Julie: Thank you! I absolutely love the fatty-tangy-(slightly) spicy combo. Esther: So happy to have your company in the brussels sprouts fan club. My husband is still on the fence, but these have turned him slightly :). Hope you two enjoy these!